A true fly has only one set of wings. All flies are known disease carriers, many of which can be transmitted to humans. 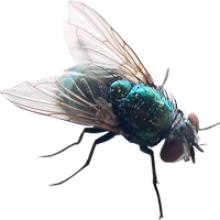 Flies typically breed in garbage, excrement of animals and humans, sewers, compost piles, and any other place where matter is decaying. This enables them to pick up various kinds of diseases which can be transmitted to people by biting or by landing on food, where the bacteria and viruses are released. Since flies are able to transmit disease so easily, it is necessary to seek insect control quickly. the diseases that they can carry include: malaria, yellow fever, encephalitis, dengue fever, and more. All flies have a rapid rate of growth and go from egg to adult in about seen days. Maggots are just one stage in the early development of a fly. Maggots of some fly varieties, such as the Carrot Rust fly, can be a problem because they eat the roots of some vegetables. The most common flies are the Fruit fly, the House fly (which have four stripes on their abdomen), the Cluster fly (which is dark gray in color), and the Garbage fly (which has a metallic color that is either green or blue). Another kind of fly, the Stable fly, typically exists around livestock. The Horse fly, and a few other varieties of flies actually have mouth parts and can bite humans. Most other flies have a sponge-like mouth and can only drink up their food.